Find all the prosthetic tools in Sekiro: Shadows Die Twice and expand your shinobi repertoire with new moves, combos, and strategies. 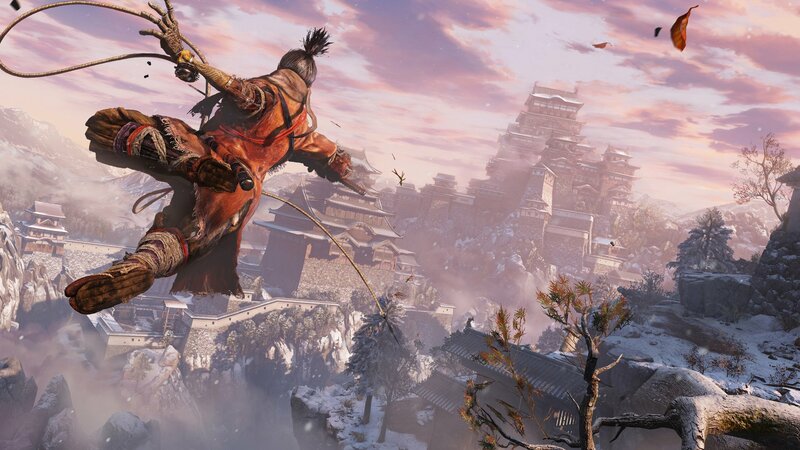 Prosthetic tool locations are dotted all around the world of Sekiro: Shadows Die Twice and finding them should be a top priority. Each prosthetic tool offers a new way of dealing with enemies and bosses. While some of these tools are found in the environment, others must be purchased from vendors. This guide will be updated until all prosthetic tools are located. There are several prosthetic tools to find in Sekiro: Shadows Die Twice. Locating all of these as you progress through the game will allow you to alter and improve your playstyle. Some of these tools offer excellent offensive moves while others provided superb defensive capabilities. 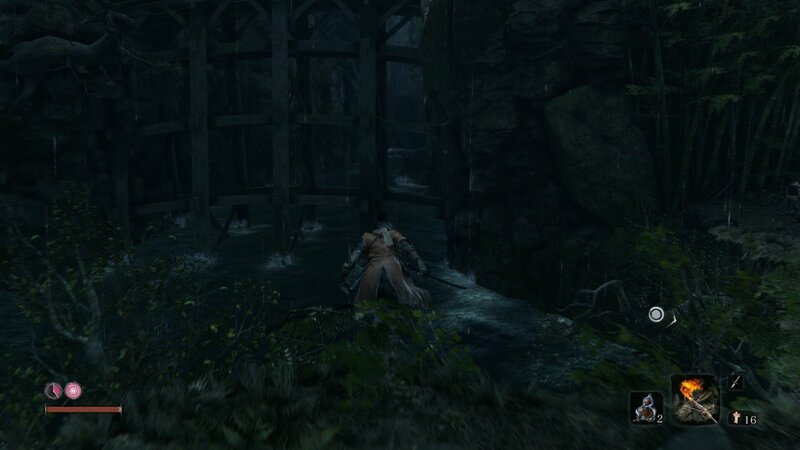 The Loaded Shuriken prosthetic tool is found in Ashina Outskirts, at the Outskirts Wall Gate Path. From the Sculptor’s Idol, look across to the gateway blocking the path to spot a broken window. Climb through the window and turn left, loot the body to collect the Shuriken Wheel. This is right before the General Naomori Kawarada boss fight. Jump through the hole in the wall to find the Loaded Shuriken prosthetic tool. The Shinobi Firecracker prosthetic tool is sold by the Memorial Mob. What this means is that the firecrackers can be bought from any one from this group of merchants. The earliest it can be purchase is from the vendor near the Outskirts Wall – Gate Path Sculptor’s Idol. 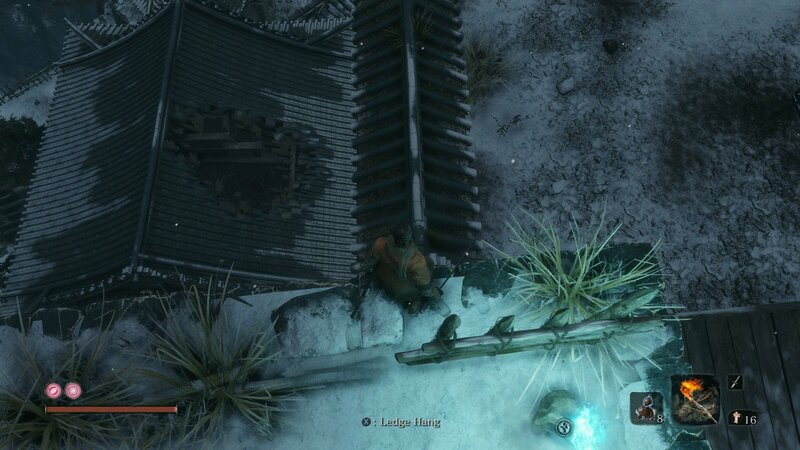 The tent to the left with the crows on it has a merchant who sells the Shinobi Firecracker prosthetic tool. To find this merchant, start at the idol and jump toward the gatehouse. Pass over it or through it and run along the side of the arena where you fought General Naomori Kawarada. Before dropping down into this next area, look over to the left to spot a tent surrounded by crows on top of a hill – this is where you need to reach. Drop down and follow the stone path around the mountain. When you reach the next building, look to the left and use the grapple point. Look left again and jump up the ledges, basically looping back on the path you took down. Use the next grapple point above you to reach the top of the mountain. Speak to the merchant and buy Robert’s Firecrackers. The Flame Vent is the first of three prosthetic tools found in Hirata Estate. From the Estate Path Sculptor’s Idol, turn right and climb on the roof. Do not go up the main street. Instead, work along the roof toward the edge of the area where the water is. 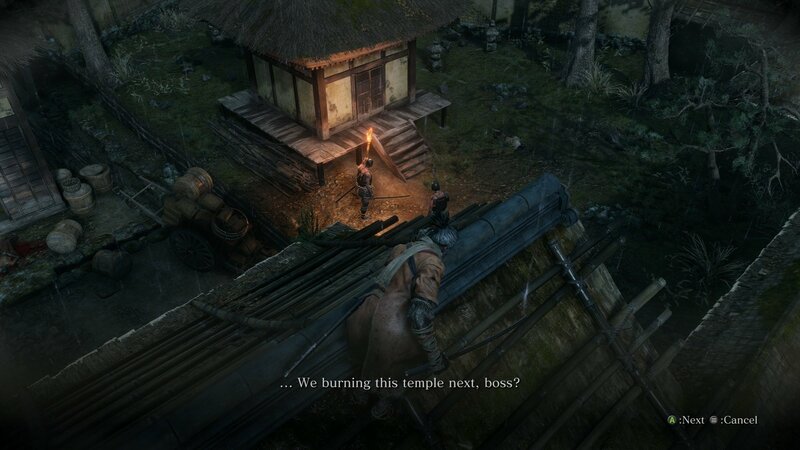 You will come across small houses with a large fire at the end, surrounded by numerous soldiers. Clear out the soldiers and grab the item from the fire, it will be the Flame Barrel, an item used to create the Flame Vent. To the right of the Estate Path idol is a little village. Look for the bonfire surrounded by enemies. Clear the enemies and grab the Flame Vent prosthetic tool from the fire. The Flame Vent is useful in most boss fights, as it’s free vitality damage. Personally, I found it most useful during the Juzou the Drunkard and Lady Butterfly fights. The Loaded Axe prosthetic tool is found in the Hirata Estate memory. 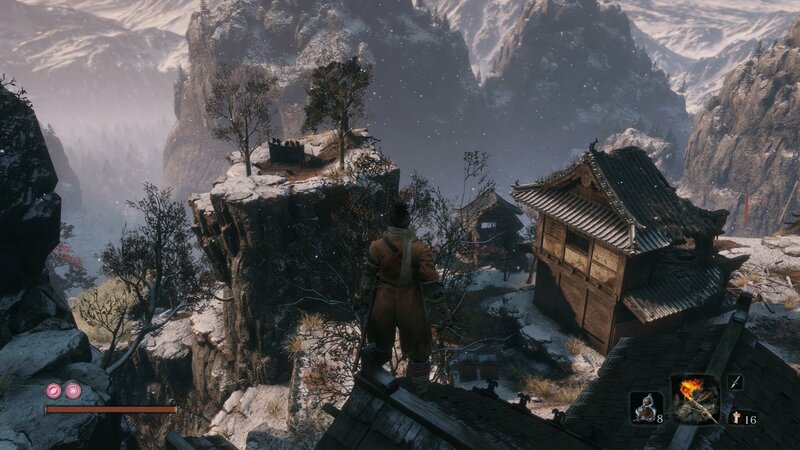 This area is only available after speaking with the old woman at the top of the building in Ashina Outskirts, Outskirts Wall – Gate Path. On the right-hand side of the main street is a collection of buildings with two men talking out front of one. Kill them and loot the temple to receive the Loaded Axe prosthetic tool. As for actually locating the Loaded Axe, start at the Estate Path Sculptor’s Idol and go up the main street. Jump onto the right-hand wall and look for an eavesdropping opportunity in one of the little enclosures. Two men will be talking about looting a temple. Kill them or wait for them to leave and then open the temple and take the Shinobi Axe of the Monkey. The Mist Raven prosthetic tool is the last one found in the Hirata Estate. From the Bamboo Thicket Slop Sculptor’s Idol, run part way up the winding stairs and use the grapple point on the left. Jump from the ledge into the water and swim upstream. Look for the grapple point past the bridge. Run up the ledge and break through the bamboo blocking the door. Wall climb up to the top of the chute and walk up the path. Quickly open the door to the pagoda and grab the Mist Raven’s Feathers. A purple warrior will jump down from the roof, avoiding him is a good idea. From the Bamboo Thicket Slope idol, jump up to the ledge on the left and then dive into the water. After a swim and a climb, you will find the Mist Raven prosthetic tool in a three-tiered pagoda. 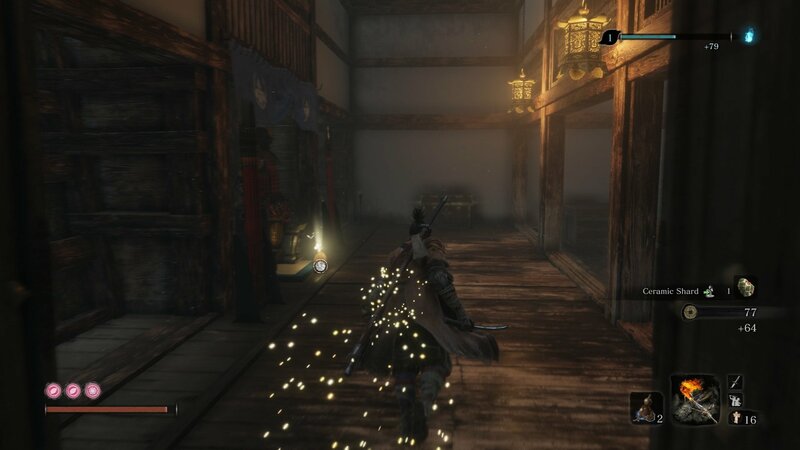 The Loaded Spear is found in Ashina Castle using the Ashina Reservoir Sculptor’s Idol. 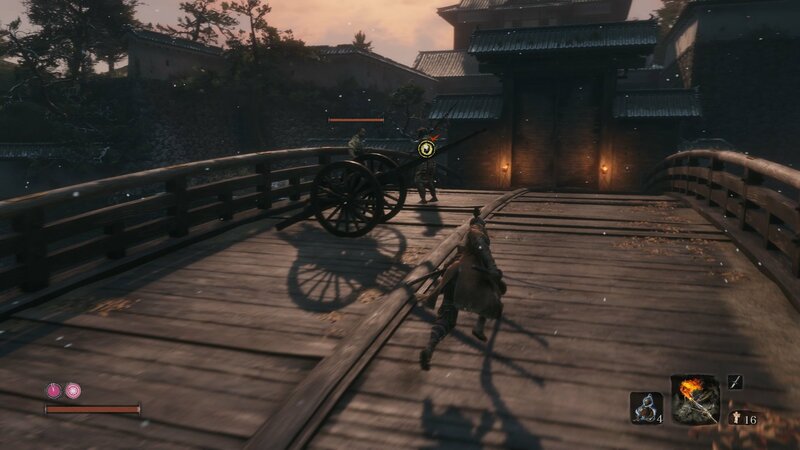 However, before you get it you must get the Gatehouse Key off of the two soldiers guarding the bridge to the left of the Ashina Castle Sculptor’s Idol. Kill the two men guarding the bridge to get the Gatehouse Key, used for unlocking the building which holds the item needed for the Loaded Spear prosthetic tool. 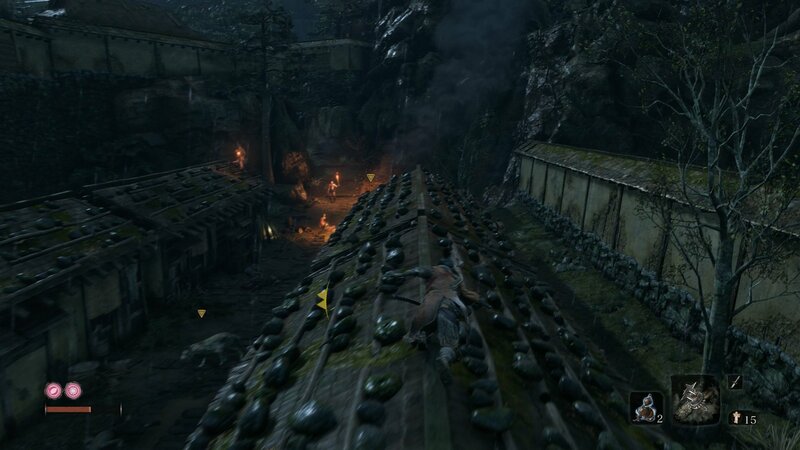 Kill the two soldiers on the bridge and with key in hand, turn back toward the Sculptor’s Idol to spot a ledge on the left. This ledge leads down to the Ashina Reservoir idol. From this next idol, defeat the two enemies and enter the next area. To your left will be a grapple point and some stairs, jump up and look to the right to spot a building. This is the building you sneaked beneath in the beginning of the game. Use the Gatehouse Key to open the door and then once inside, open the chest to receive Gyoubu’s Broken Horn. 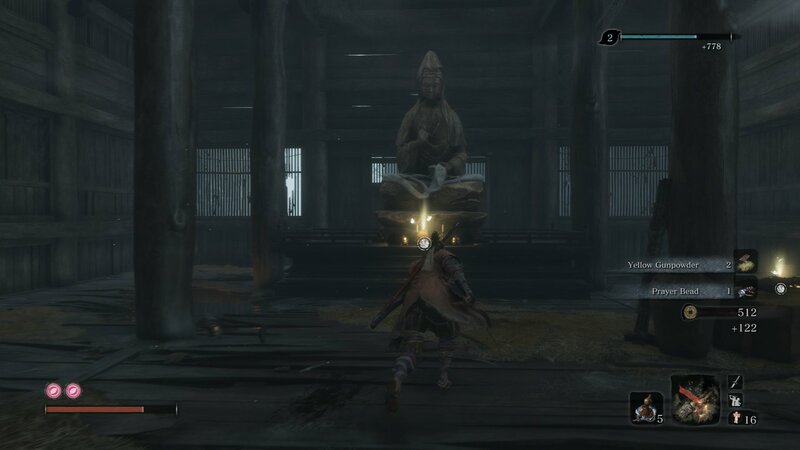 The Loaded Umbrella is found in the Ashina Castle near the Old Grave idol. This prosthetic tool is sold by a merchant called Black Hat. To find him, start at the Old Grave and look over the ledge, below you will be a building with a hole in the roof. Jump through the hole to find Black Hat standing there. You can purchase the Iron Fortress from him for 1,600 sen.
Look over the edge near the Old Grave idol to spot the building with the merchant who sells the Loaded Spear item. The Sabimaru is a small blade that can be used in tandem with your sword to poison enemies. The Sabimaru prosthetic tool is found in Ashina Castle using the Upper Tower – Antechamber Sculptor’s Idol. From the idol, go up the stairs and into the room with the walkways. Jump over the railing to fall down to the lower floor. Kill the enemies or run past them into the next room – there will be a chest up against the back wall. Open the chest to collect the Sabimaru short sword. 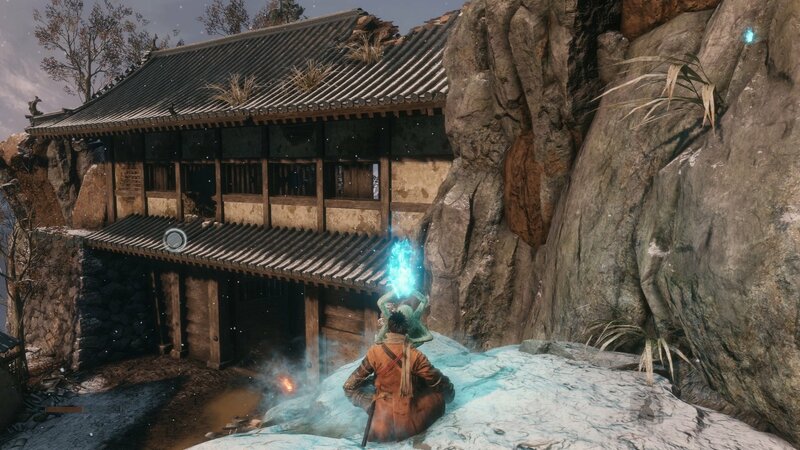 This information can also be purchased from the merchant at the Dilapidated Temple if you saved him from the samurai in the streets of Ashina Castle. The Divine Abduction prosthetic tool can be used to progress the Kotaro quest line, the sad monk in Senpou Temple. The Divine Abduction is found in the Sunken Valley using the Gun Fort Sculptor’s Idol. You must defeat the Long-arm Centipede Giraffe in order to remove the fog wall. Loot the item from the statue once the mini boss dies to receive the Large Fan, take it back to the Sculptor to have him turn it into Divine Abduction. Finding and collecting all prosthetic tools in Sekiro: Shadows Die Twice is worth the effort. Each tool behaves different and offers a new upgrade path. By unlocking all the prosthetics, you can begin experimenting with different builds and working out the best strategies for defeating bosses. Check out the Shacknews Sekiro: Shadows Die Twice page for more information and guides.